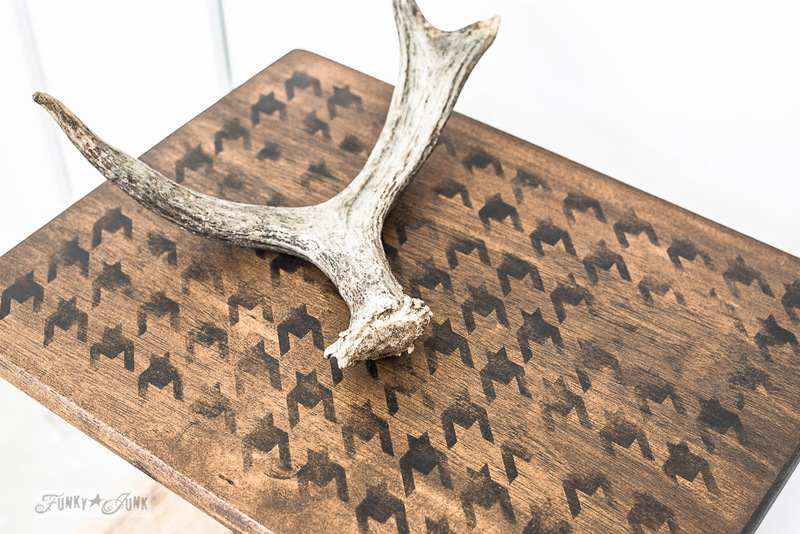 There’s a new member to the stencil family, and I had a boring TV tray that was calling its name! I’m so glad I hung tough on the tray until now. Because I am digging the new look which was all too easy to create. Isn’t it sweet? Well, hello there TV tray I’ve had in my stash since… actually, not that long! I decided to go on a little thrift store shopping spree awhile back, challenging myself to pick up solid wood pieces that would be fun to revamp. And this guy landed in my cart. 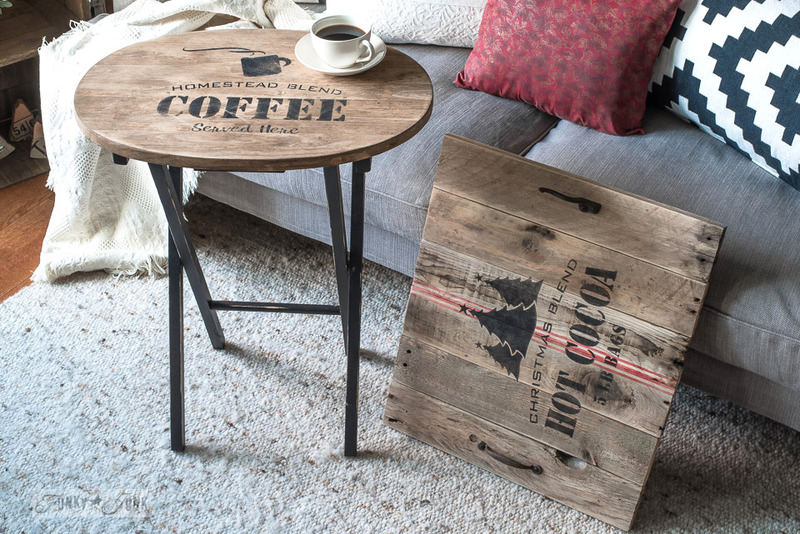 You’ve seen these pine toned TV trays all over the land. And in many cases, you can scoop them up pretty price efficiently at any thrift store like I did. 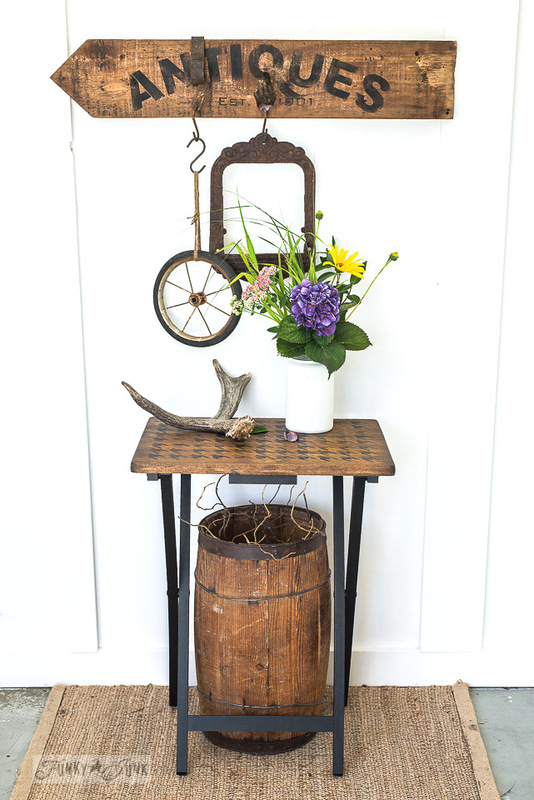 What I DO love about them is the fact that they are solid wood and easy to cart around. What I don’t love about these trays is their lack of personality as-is. But thankfully that gives us a super fun challenge! It even has a Christmas-themed top that slips into place! That was fun! 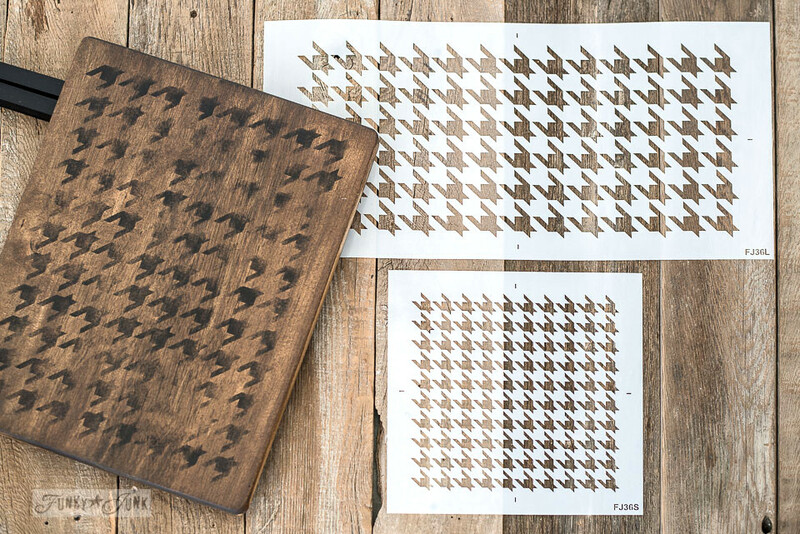 So, the entire time I eyed my current tray, I kept thinking a largish houndstooth pattern would suit it. Houndstooth just spoke to me. It has a classic design, but I wanted to add my own twist. This one was gonna be REALLY distressed. Kinda like weathered fabric. Houndstooth is a pattern that resembles a fabric stitch, that comes in two different sizes / scales. Fun for both small and large projects! I am dying to get my hands on the right dresser so I can do a large pattern on top, and small pattern on the sides of the drawers. And I shall keep hunting until I find that special piece! 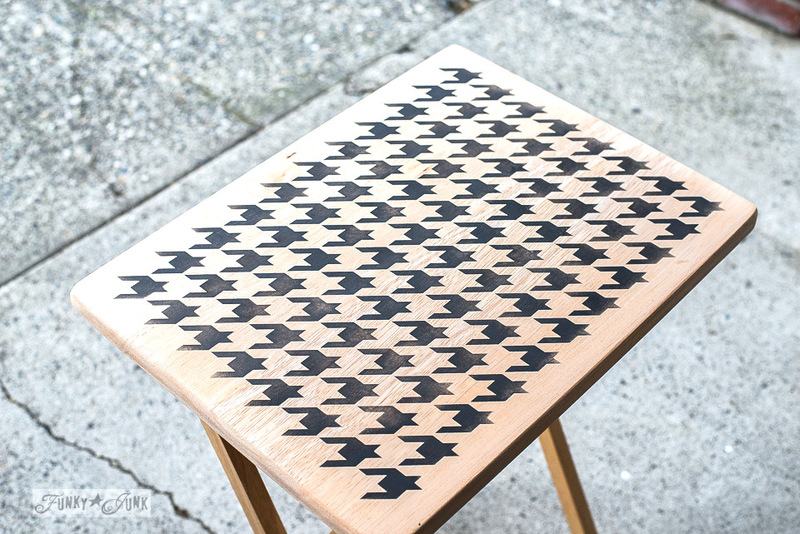 I did debate on painting the entire tray for more of a classic houndstooth look of white on black. And this the look I came up with! What was fun about working with this pattern is, before I distressed it, it had a super modern crisp and clean vibe to it. Distressed, and it was back to rustic and well worn comfort. Cool how it marries both looks so well. 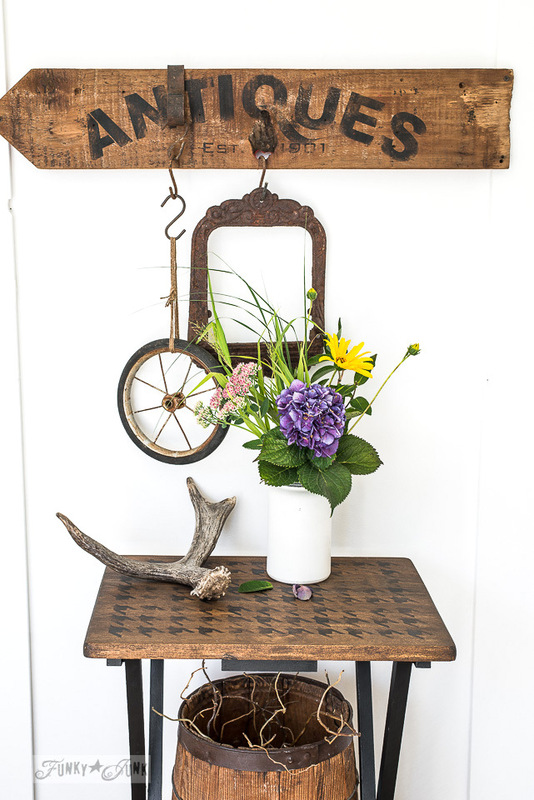 HERE is a Houndstooth Pinterest board you can visit to get some other ideas. 1. Sand the surface of the TV tray to remove the existing finish. I used a medium grit. 2. Centre the stencil on your surface. 3. 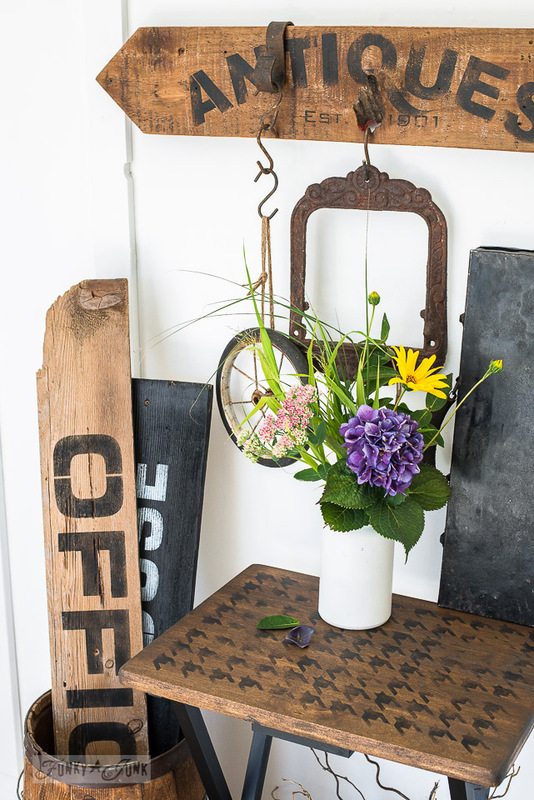 Tape off any design parts you don’t wish to stencil. I chose to create a ‘wood frame’ around my design, so I taped over design elements I didn’t wish to show. Click photo to get more of a close up. 4. Stencil on pattern in an uneven, more transparent look. 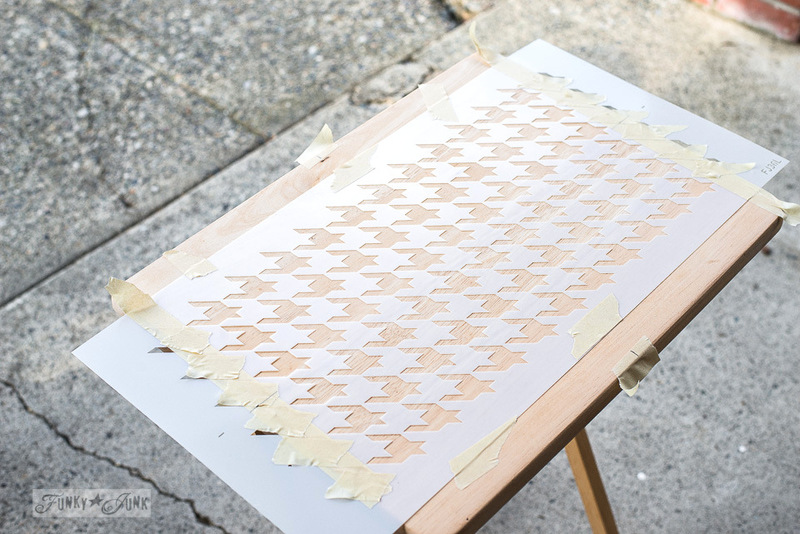 Reposition the stencil against itself, then continue to stencil until complete. Wet the brush in water, then dry. Load brush with paint, then offload most. 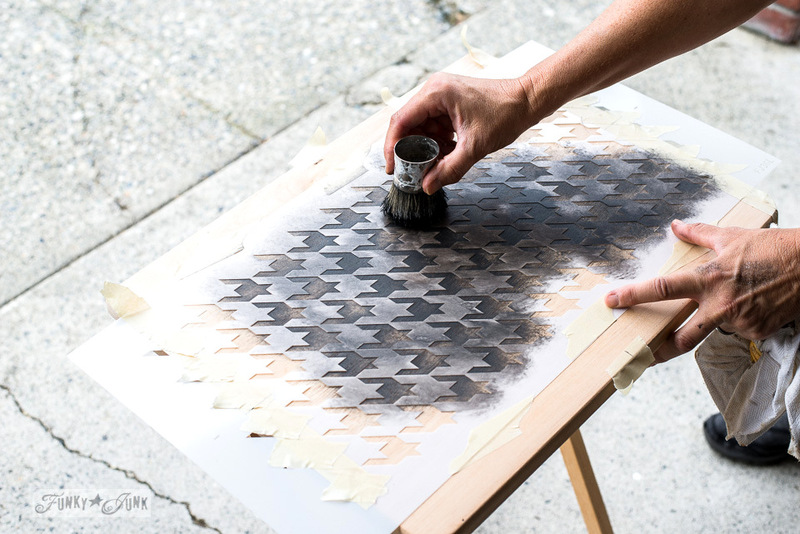 Ensure your brush is very dry to the touch, then gently swirl over the stencil unevenly. The images were super sharp! Dial to #1 with a variable speed palm sander. Sand unevenly along the painted areas. 6. Stain over top of the stenciling. 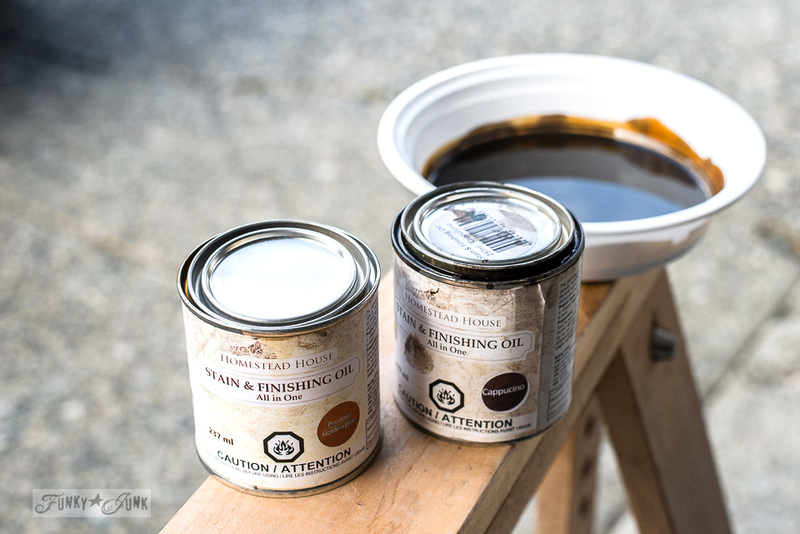 Brush Stain & Finishing Oil on, wait a few moments, then remove with a soft rag. Repeat if you desire a deeper tone. What I love about this particular stain is the fact that there little to no smell. You can do this indoors without issue! I did not show this step because I wasn’t sure I’d have enough open time to work the stain before it dried while I took pictures. Turns out I didn’t have to worry. The open time to work with the stain is very generous! This step is shown in the video at the end of this post. 7. 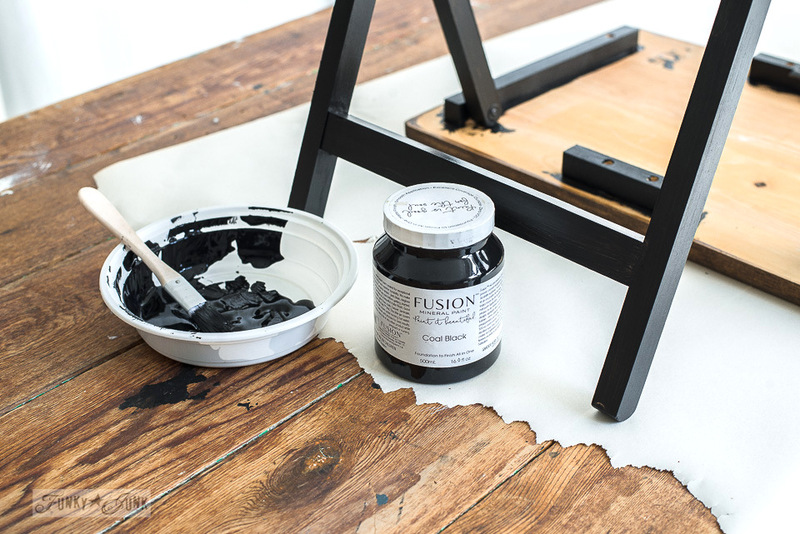 Paint the base of the TV tray with Coal Black. 8. 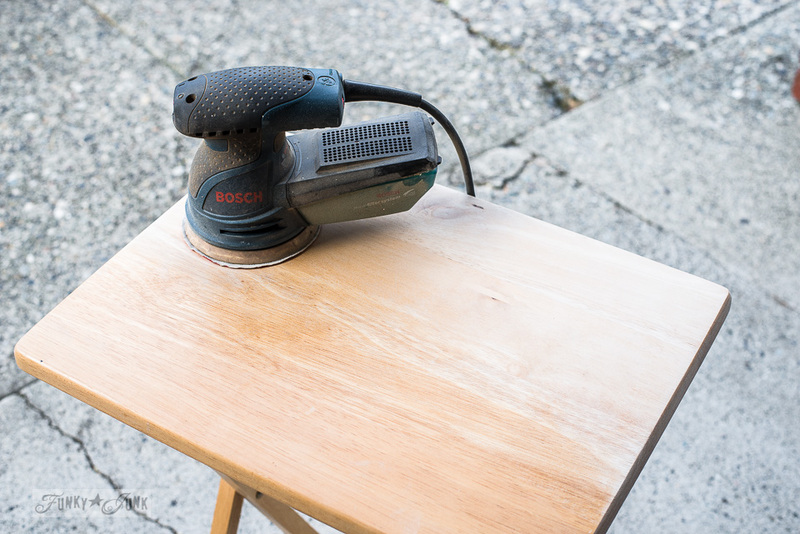 Once stain is dry, lightly sand the top with fine sandpaper. 9. Top with Fusion’s Beeswax if desired, although not necessary. I found the wood grain on top to the TV tray could probably have used a wood conditioner first, as my finish was a little shiny in spots and dull in others. The Beeswax evened everything out, and added a deeper lustre to the wood tone. It turned out AMAZING and smooth as butter. 10. 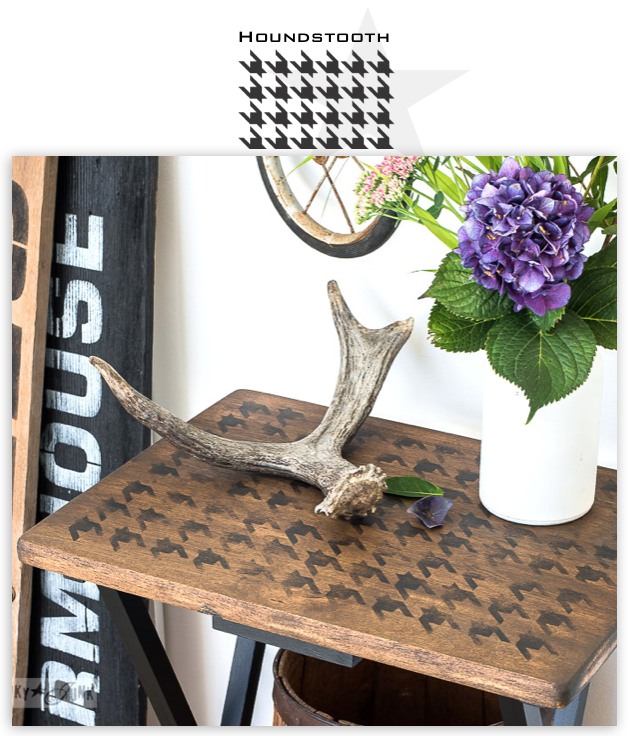 Then… enjoy your delightful new – old Houndstooth topped TV tray! 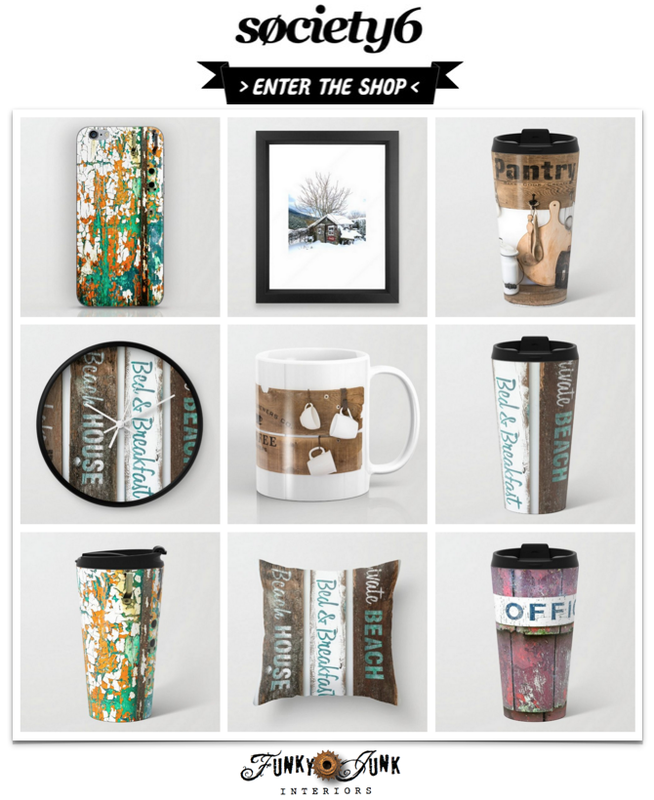 This pattern makes rustic ‘ol me feel a little fancy. It’s like a hip antique. 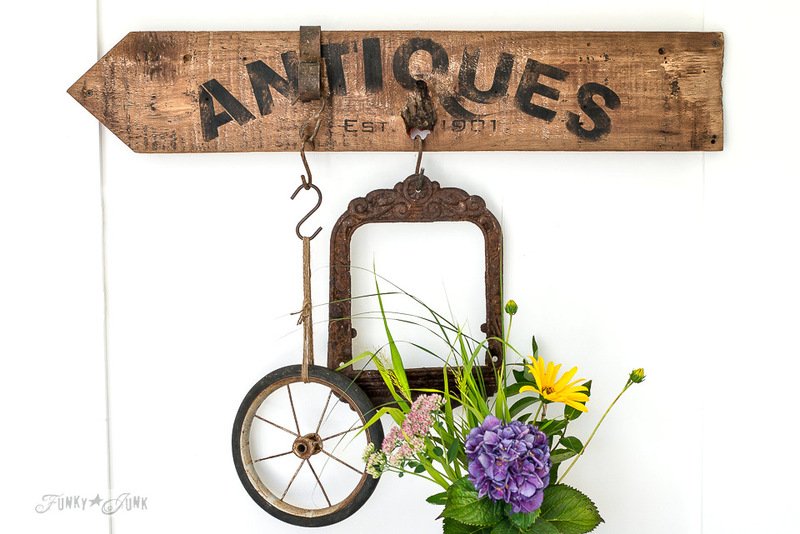 And I whipped up an Antiques arrow sign in about 30 seconds as well for this shoot! 1. Cut tip of board in two 45 degree angles to create the point. 2. Stencil on Antiques and EST 1901, then lightly hit the lettering on #1 with a variable speed palm sander to distress. 3. 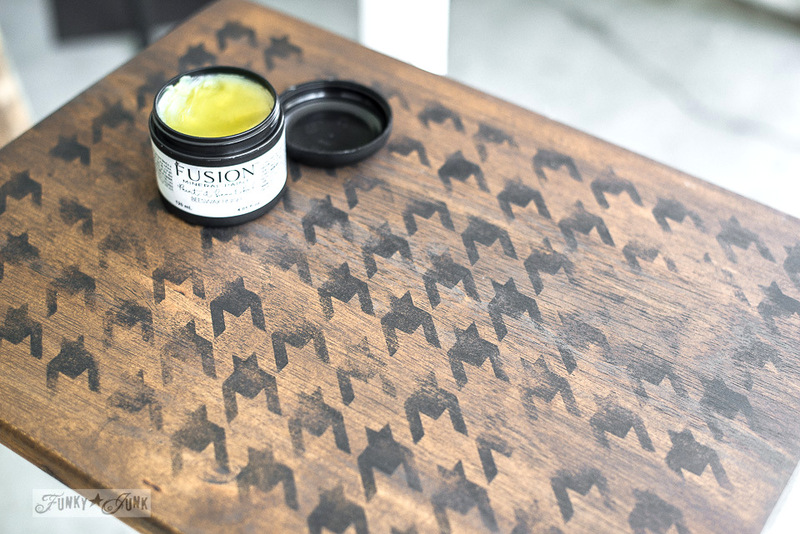 Cover the board with Beeswax to bring out the lustre of the wood and enhance the lettering. Well now, that was fun. What can I get my hands on next?! What could you see revamping with this design? I love it! Can’t wait to get the stencil! You never stop amazing me. I love, love, love this post. 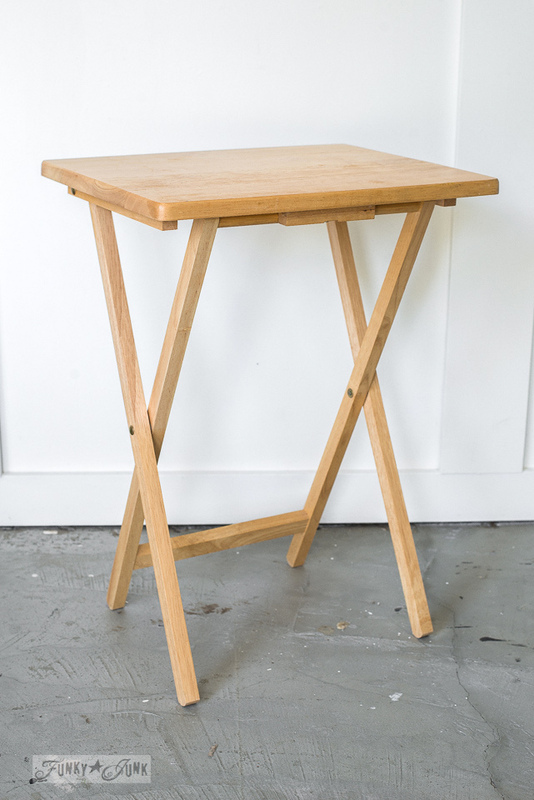 I have four of these card tables, and I hope to create this look before Thanksgiving. Thank you! 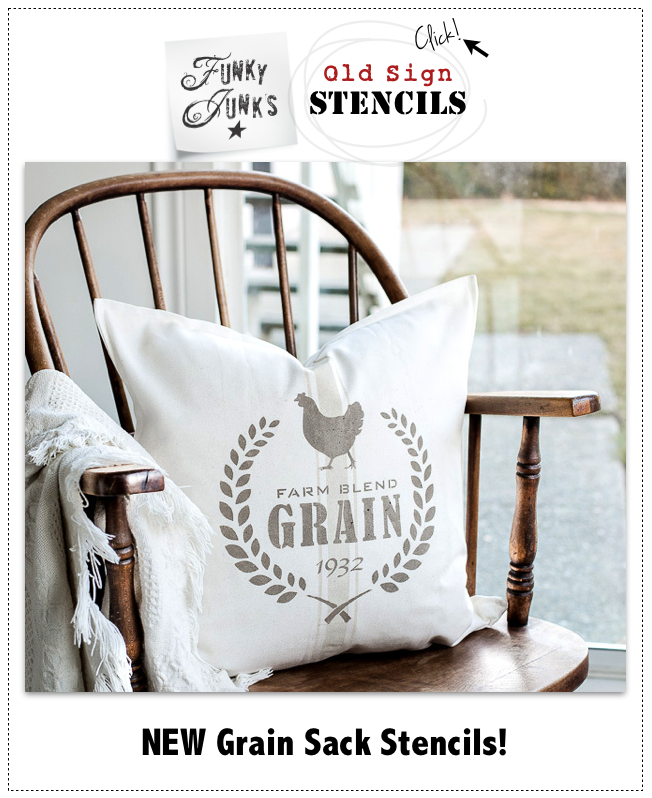 I love the rustic charm of the houdstooth stencil Donna! 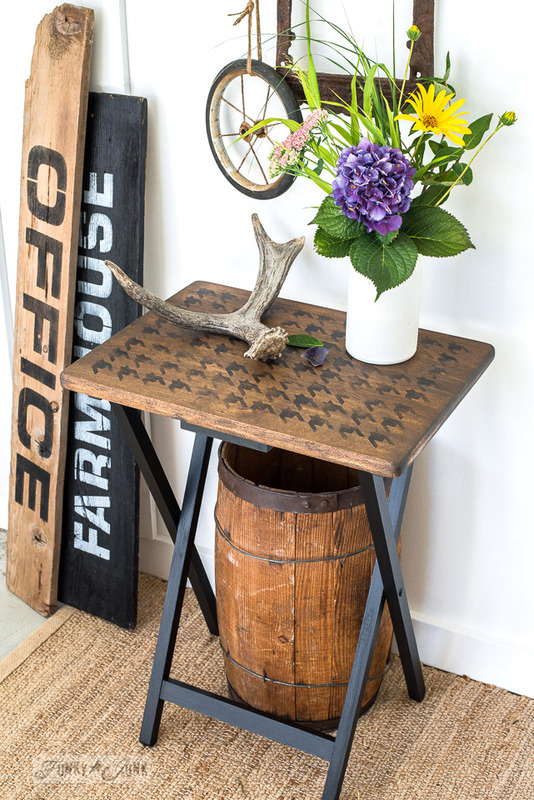 Love the houndstooth stencil and how you update this tv tray with it!! I love this! Such a fun project. I have a whole set of these in my basement just waiting to be refinished. Sounds like a fabulous opportunity to try some new techniques! 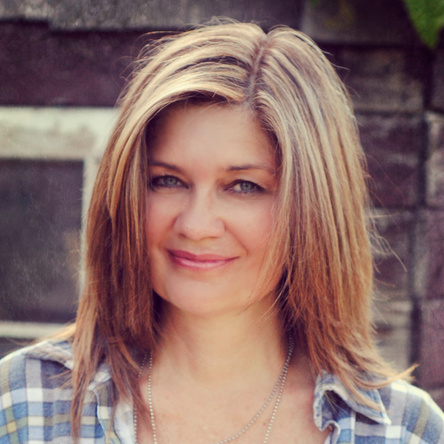 They are easy revamp projects!